American coin silver fancy baby cup with floral and scroll repousse decorations, Ball Black & Co, NY, c.1860. 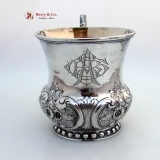 This beautiful cup is 4 3/8" tall, 4 3/8" across the handle, 3 1/8" in diameter and weighs 154 grams or 5 ozs Troy. The soft, warm, original finish is present, with no buffing or machine polishing. The excellent original condition and clear, crisp detail, monogrammed ABSC in an ornate period script, no removals, repairs or alterations, make this an especially attractive offering.